In Cook County you will find the affluent suburban village of Glenview, Illinois. Glenview is part of the upscale group of northern Chicago suburbs known as the North Shore. Home to around 44,700 residents, Glenview is a great place to buy a home if you are looking to relocate in the Chicago Metropolitan area. Composed of approximately 14 square miles, mostly land, Glenview is a great place to live for retirees, young professionals and families alike. Known for its exceptional public education, Glenview’s Glenbrook South High School was ranked as the 19th best public high school in the nation by Business Insider in 2014. In 2015 Glenview’s Glenbrook School District 225 was ranked 2nd in Illinois and 10th in the nation, also by Business Insider. There are multiple districts serving the Glenview community, in addition to Glenbrook School District 225, you’ll also find students served by Glenview School District 34, Wilmette School District 39, Avoca School District 37, Northbrook/Glenview School District 30, West Northfield School District 31, East Maine School District 63, New Trier Township High School District 203 and Maine Township High School District 207. Incorporated in 1899, Glenview was primarily farmland until after World War II when developers began to reshape the township giving it a new suburban appearance. Today Glenview is a wonderful community with several remarkable neighborhoods, each boasting its own unique atmosphere and amenities. The Park, located in the heart of Glenview, is one of the village’s oldest neighborhoods and was designed by Swain Nelson, one of the architects that designed Lincoln Park. The Glen is a 1,121 acre development in Glenview composed of Glen Town Center, a lake, soccer fields, offices, Kohl Children’s Museum, Glenview Park District Park Center, the Glen/North Glenview commuter train station, hiking and biking trails, two golf courses and many new homes. These are just a few of Glenview’s impressive neighborhoods and their wonderful features. Homes for sale in Glenview, Illinois, vary in age, size, architectural style, location and special features. 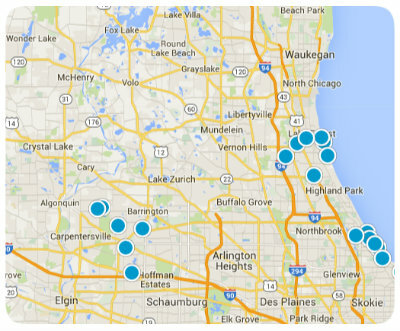 With those variables, the price of homes for sale in Glenview also vary. A co-op in Glenview has an average listing price around $310,900, while a condo or townhome has an average listing price around $380,800. Single family homes in Glenview have an average listing price around $830,700 and generally do not exceed $3.2 million. Condos and townhomes top out around $819,000. With its wonderful location, great neighborhoods and amenities and diverse real estate, Glenview is an excellent choice for prospective homebuyers of all budgets and personal tastes. If you would like to buy a home in Glenview, Illinois, please allow us to assist you and contact us today for more information.